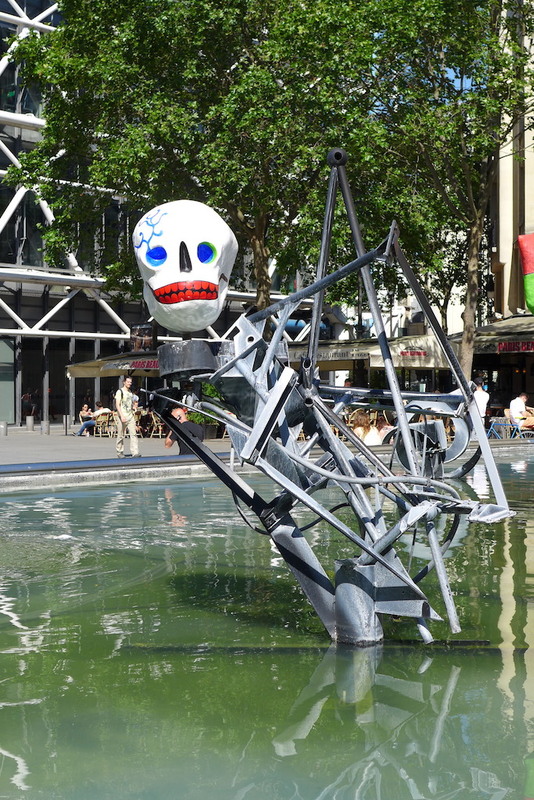 This monument was to create a link between the modernity of the Centre Pompidou in the north and the Gothic architecture of the Church Saint Merri in the south… and the result is absolutely perfect! 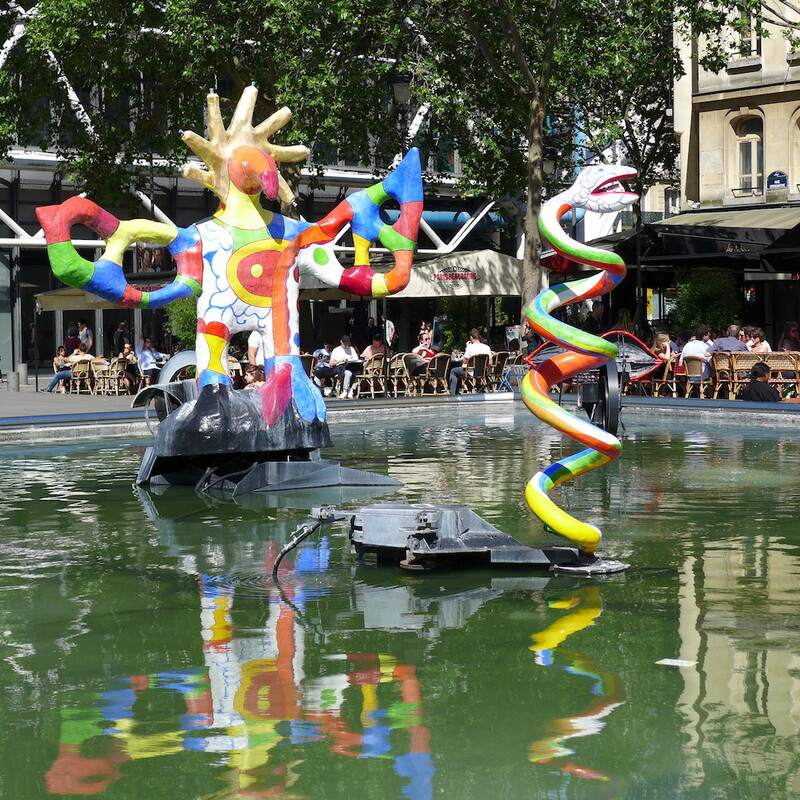 The size of the pond, the fitting-out of the square, the poetic, magic and childish nature of the sculptures make this place look like a go-between through times. 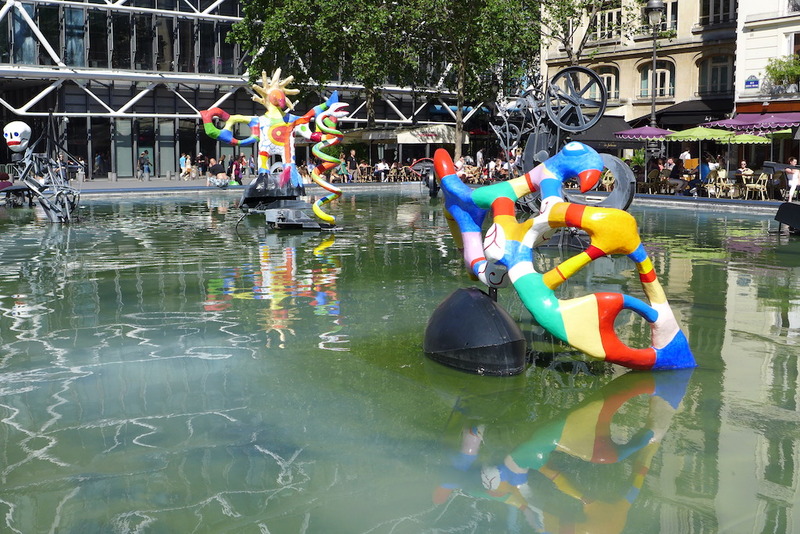 When one comes from Saint Merri and the narrow streets surrounding the church one appreciates the progressive opening to wider and more modern spaces offered by the peaceful and a bit timeless fountain, before reaching the Centre Pompidou and its majestic esplanade. 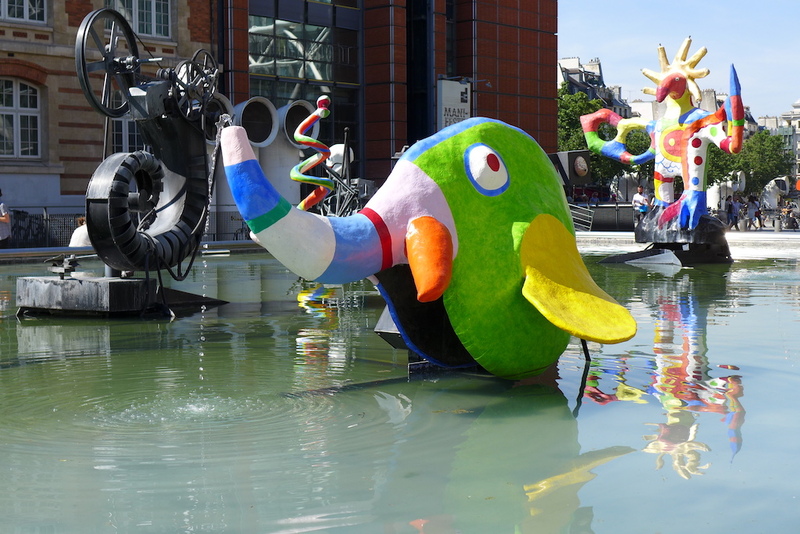 And if one comes from Beaubourg one can go back in time gradually. 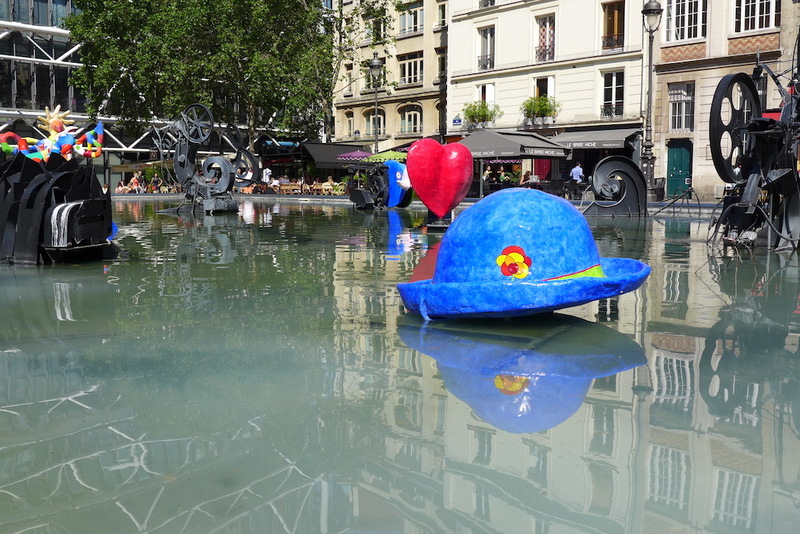 Before entering Saint Merri or the surrounding alleys one is invited to have a sit along the pond so as to enjoy the peaceful atmosphere, admire the colourful and poetic sculptures and listen to the real musicians often playing on the square. 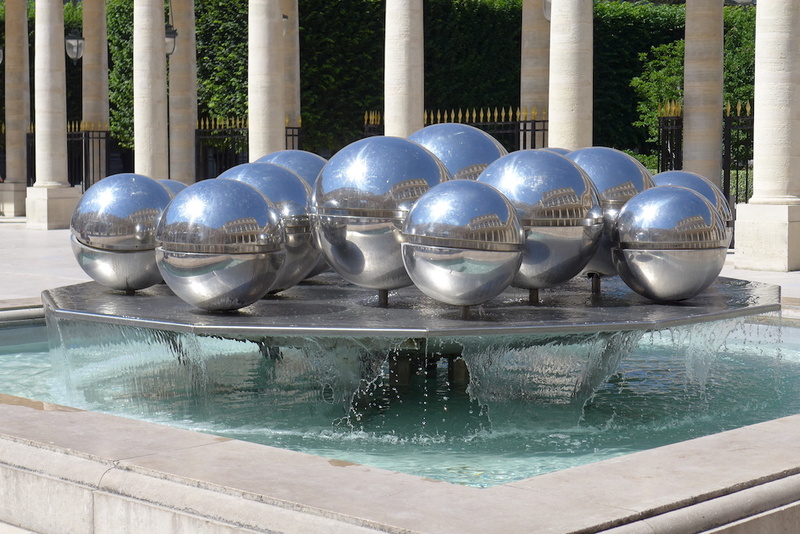 The ‘Sphérades’ are two fountains located in the Cour d’Orléeans, between the Cour d’Honneur of the Palais Royal where one can see the famous Columns of Buren and the Palais Royal Gardens. They were designed by the Belgian artist Pol Bury and inaugurated in the same time as the Columns of Buren, in 1985. 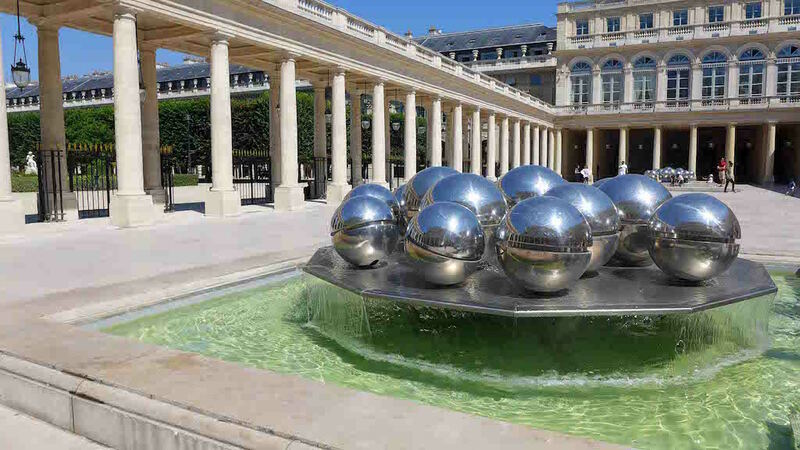 Like the fontaine Stravinsky they act as a go-between and create a link between the columns which are a static and mineral work of art and the gardens, alive with their trees, thanks to the gentle noise of the water and to the slow movement of the balls. The ‘Sphérades’ were put in pre-existing bowls and one can sit on the edge of them and dip one’s feet in the water. 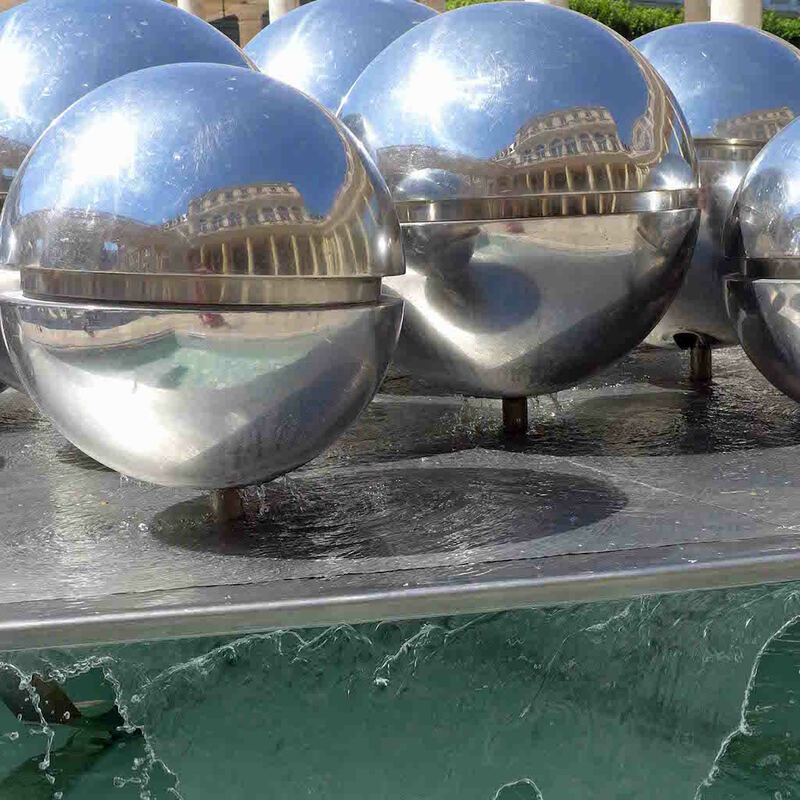 Children like to cool down by standing in the water while adults only dip their feet… And all enjoy the sight of the sky and surrounding columns which are reflected in the seventeen steel balls of each fountain. 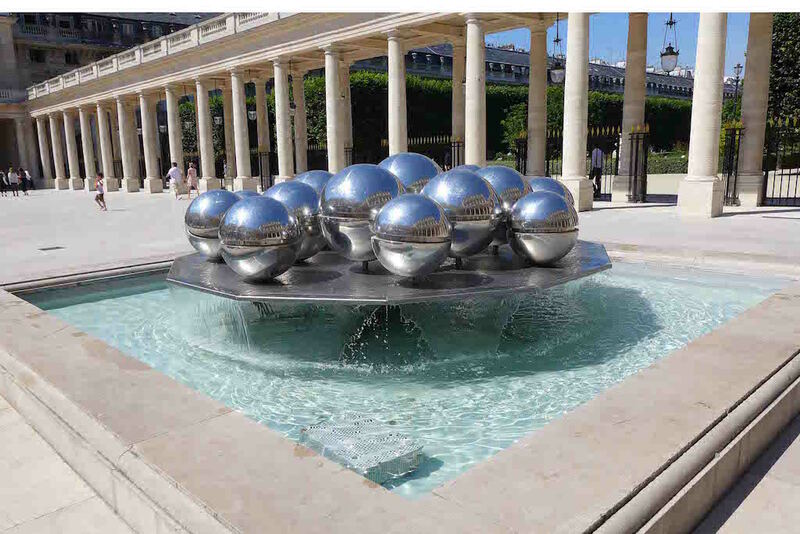 I like the very pure design of the fountains and the contrast between the round form of the balls and the straight shape of the nearby columns. 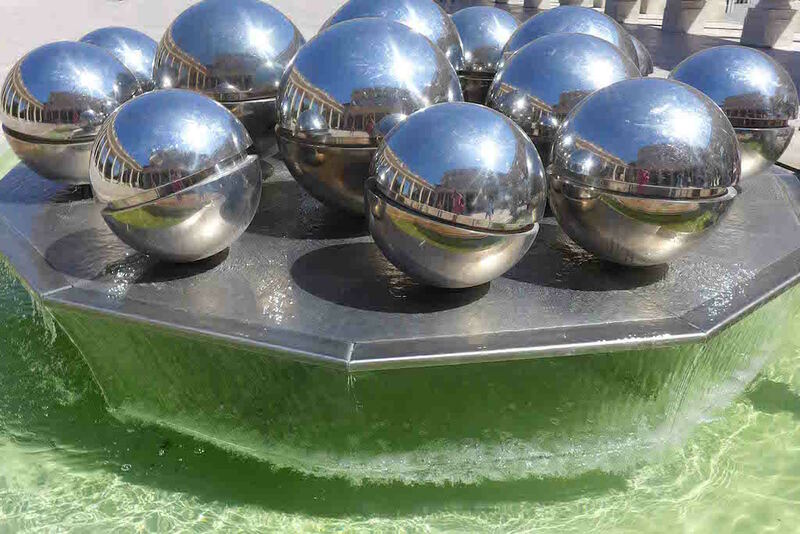 And above all I love the changing appearance of the balls, depending on the colour of the sky and on their positioning as they gently move with the water. 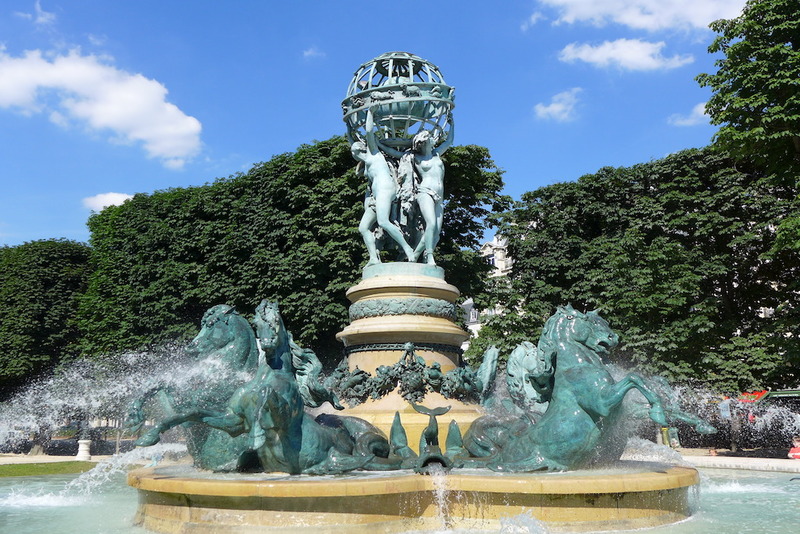 The ‘Fontaine des quatre parties du monde’ is in my opinion the most remarkable fountain in Paris thanks to its architecture and to its location. 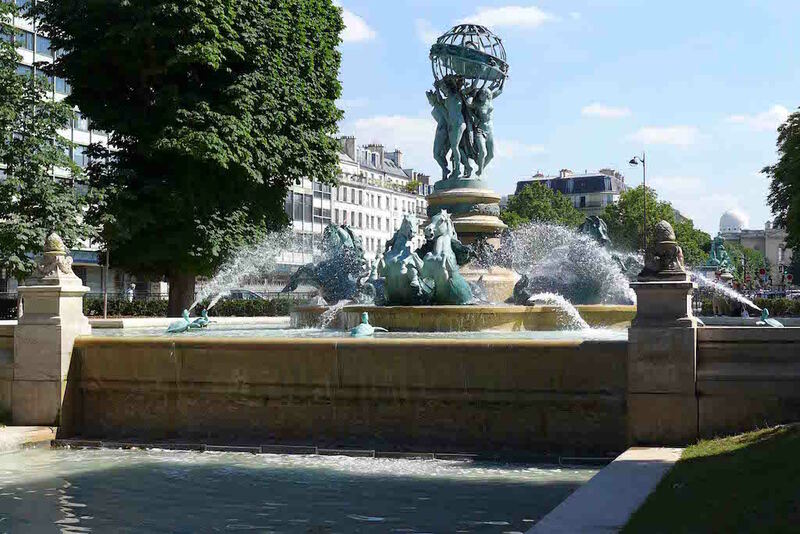 Indeed the ‘Fontaines des fleuves’ on the Place de la Concorde is even more majestic but its location in the middle of a square surrounded by cars is not so pleasant and one cannot enjoy it as much as the ‘Fontaine des quatre parties du monde’. 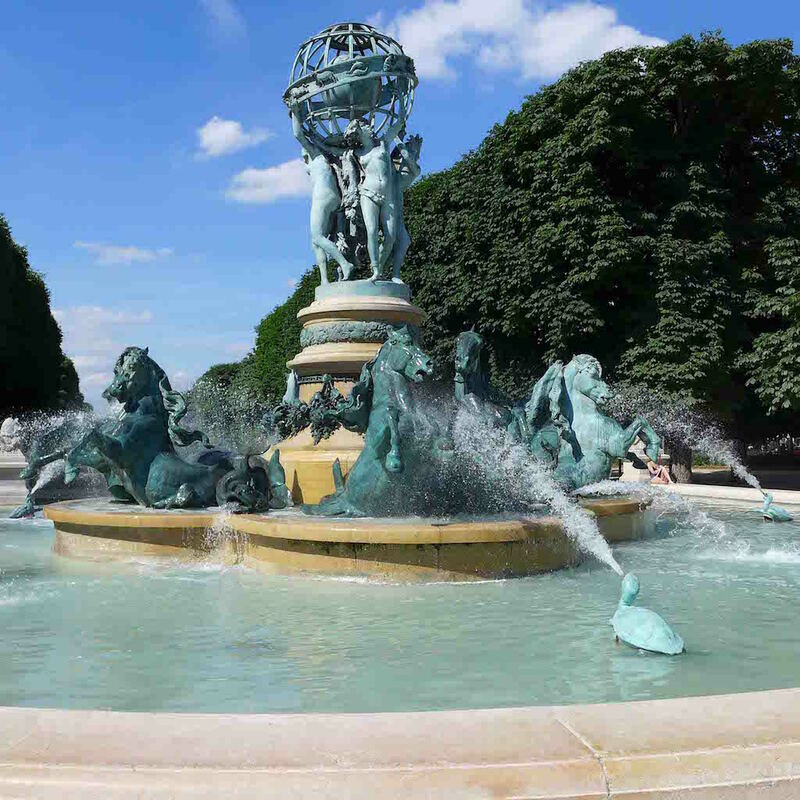 This fountain is located in the Marco Polo Garden on the Avenue de l’Observatoire, between Port Royal and the Luxembourg Garden. The local people also call these gardens the ‘Petit Luxembourg’ as opposed to the main Luxembourg Garden. 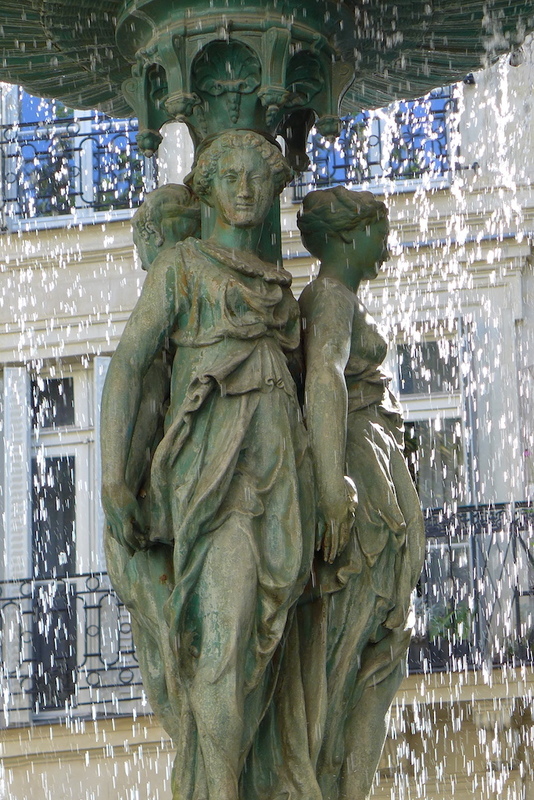 It is a beautiful monument which was built by several sculptors between 1867 and 1874: Jean-Baptiste Carpeaux (also famous for his sculpture ‘la Danse’ at the Opéra Garnier) designed the four young ladies who represent the four continents, Africa, America, Asia and Europe. The globe that they carry above their heads and that is illustrated with the signs of the Zodiac was made by Eugène Legrain. 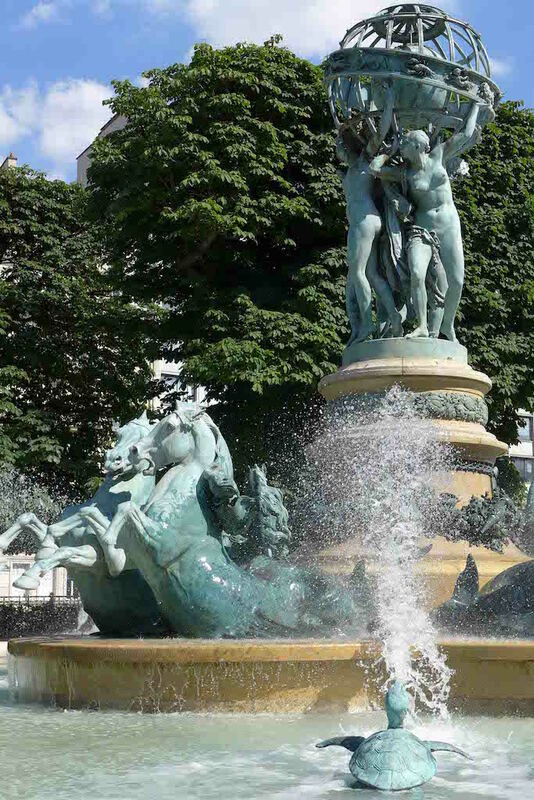 Finally the animals in the pond -eight horses, four dolphins and eight turtles- were sculpted by Emmaunel Frémiet. The whole is very harmonious: I love it! 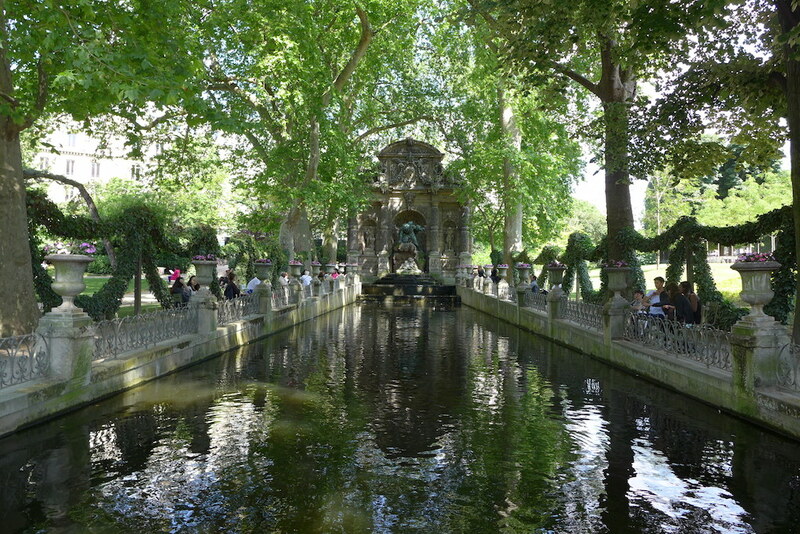 And I also love the pond located at the back of the fountain: it is surrounded with grass where one can sit or lie and take a breath of cool air thanks to the nearby water with a view on the fountain and on the chestnut trees of the Marco Polo Garden: A true delight! 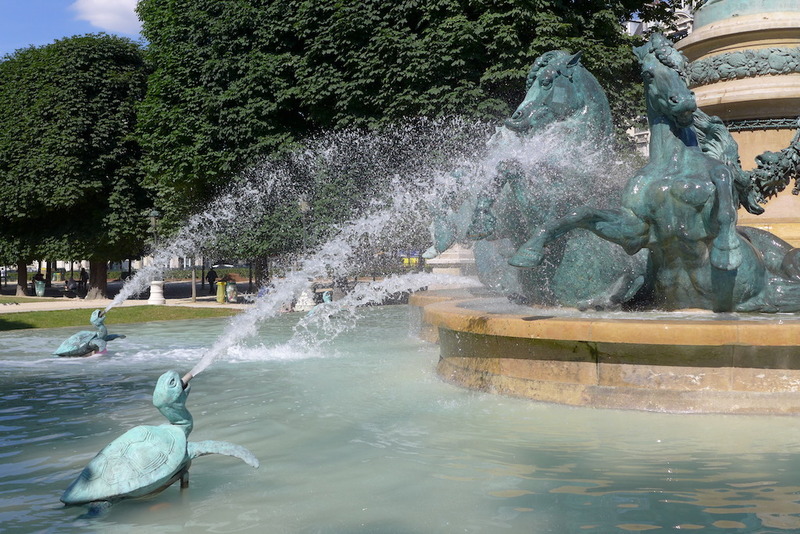 The neighbouring Luxembourg Garden shelters many other fountains… including a very special one which is the most romantic area of the garden: The ‘Fontaine Médicis’. Shadow and Coolness guaranteed! The fountain is located in one of the most hidden part of the garden: next to the Senate but under trees which make it invisible to the walker in a hurry. 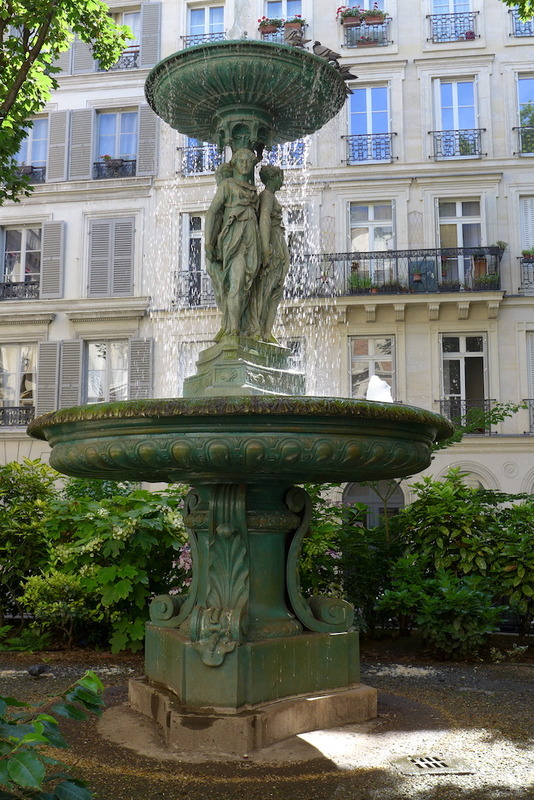 The ‘Fontaine Médicis’ gets its name from the Queen Marie de Médicis who ordered its building around 1630. At that time the queen was a bit nostalgic and hoped to feel again the atmosphere of the caves and gardens of her native Italy! 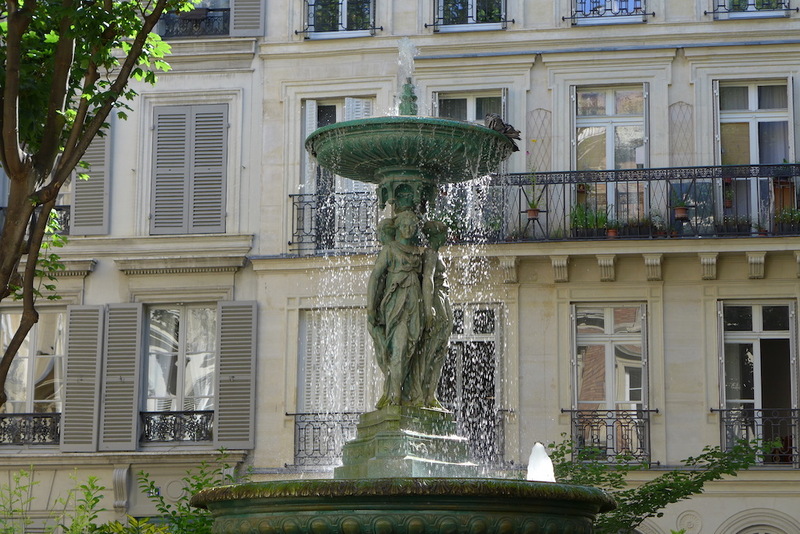 Since it was built the ‘Fontaine Médicis’ experienced several transformations and was even moved stone by stone to its present location. The long pool lined with vases which lies in the front of the fountain was added after this moving, in 1860. 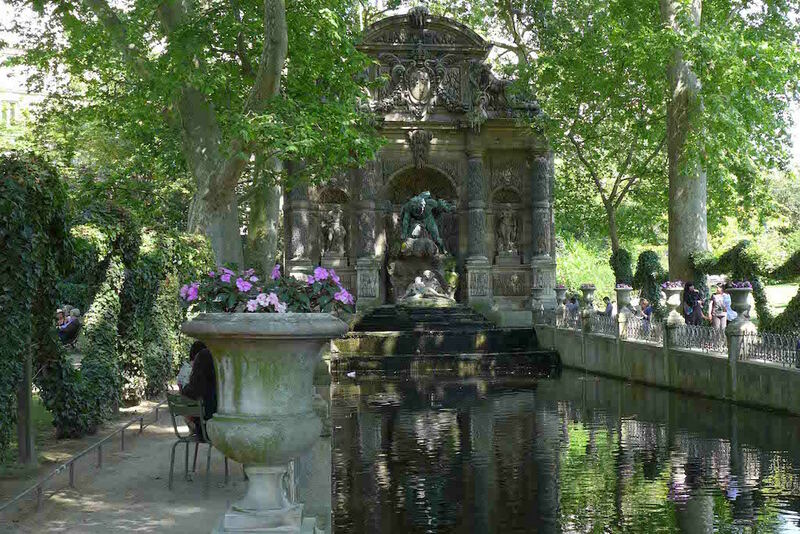 Today the ‘Fontaine Médicis’ is THE place in the Luxembourg Garden where to rest, dream or read… or kiss, away from the crowds and out of sight: peaceful, shady and romantic! The last fountain of my selection is the less famous and the most secrete of the five. Unlike the other four it is not a fountain where one can enjoy sitting at the edge of it. Nevertheless it is so beautiful, unexpected and located in such a charming and peaceful place that it is really a must-see! 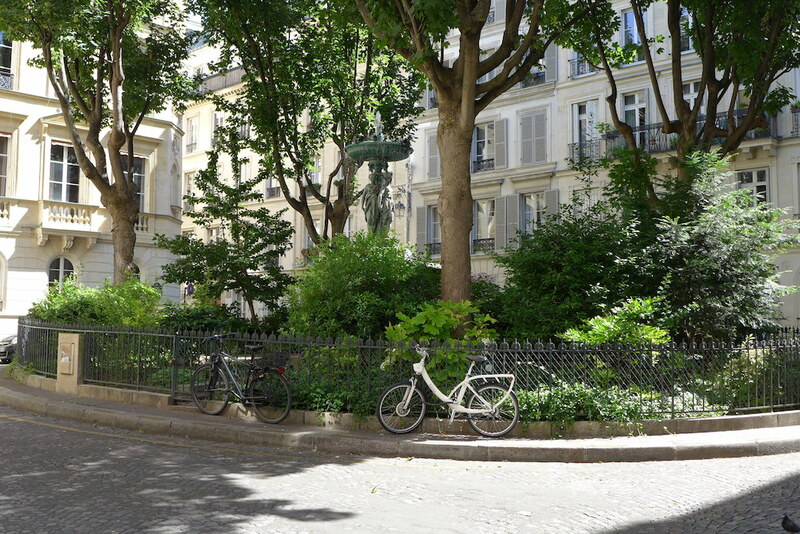 The Cité de Trévise is a lovely cobbled street located in the 9th arrondissement of Paris. It was built in 1840 and is lined by beautiful buildings in the Renaissance style. 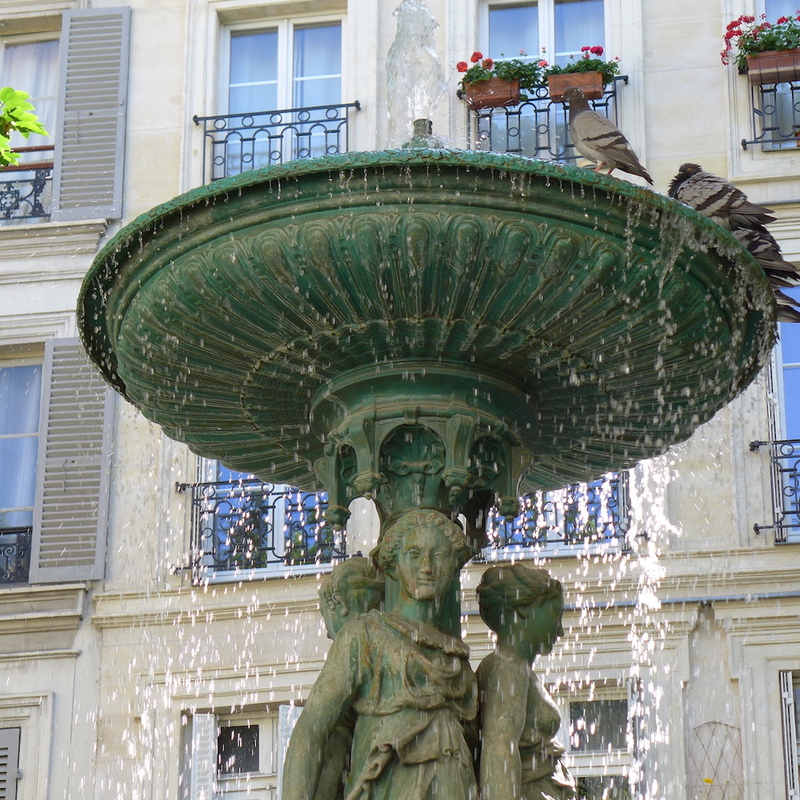 Its quietness contrasts with the liveliness of the nearby ‘Grands Boulevards’ and is much appreciated by the local people. In a place the Cité de Trévise bends and opens onto a charming square lined with beautiful buildings in the Renaissance style. 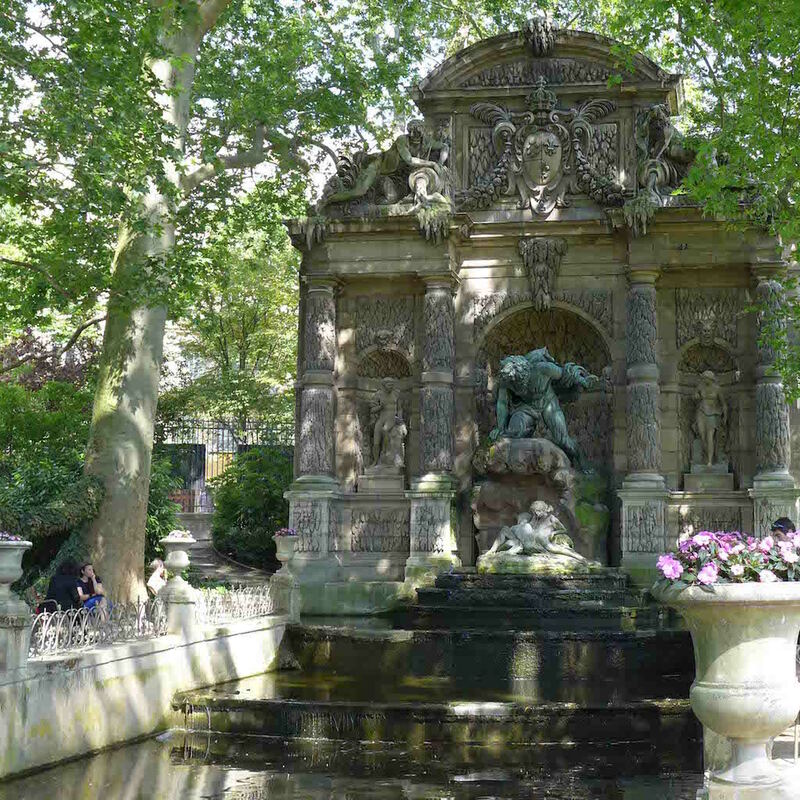 There lies a tiny garden closed to the public and in the middle of it one can admire the ‘Fontaine de la Cité de Trévise’ surrounded by four majestic plane trees. Well before seeing the fountain one can hear the continuous noise of the water and, when one discover it, one is delighted by the magic of the place: so peaceful, so romantic… The only thing missing are benches where to sit and enjoy the motion and the noise of the water and the frolics of the pigeons in the water! 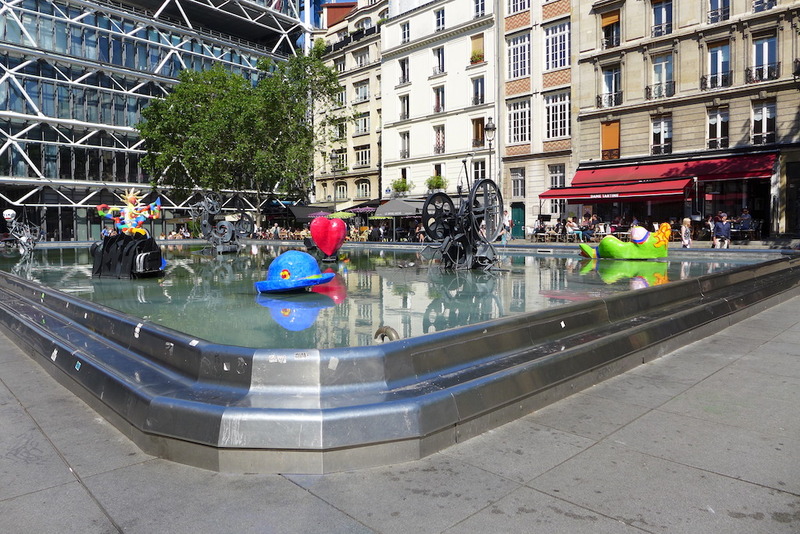 And here are some more pictures so that you feel like going and discovering these five amazing fountains at once: Enjoy! Hi, Nice stuff. I can’t wait to read more of your blog. Next Next post: Paris Plages by Night: So Romantic!